Do you still remember Aqua, a Scandinavian band that was popular 6 or 7 years ago. One time (I was in Singapore) saw them on TV interview by a VJ. He asked them, 'How can you see in the dark winter?' (the country has totally darkness for months) . The lead singer luckily could stopped strangling herself (or him!) on time before screaming out 'We have street lamps!'. I believed the VJ just meant, 'How's thing going in such days?' . When we come across another culture, we better avoid to interpret things too literally. Same attitude applies to food... have you ever blamed the foreign recipe that you just failed terribly? I love The Great Scandinavian Baking Book from Beatrice Ojakangas, and her recipes always give very satisfactory results. Except one time I tried my hand at her Norwegian Christmas cookies, everything just didn't turn out right, what's wrong? Suddenly a light bulb flashed over my head... this recipe's about Norway, in Christmas time (feel that freezing cold air?). That explained why I was struggling with my messy dough in that afternoon...errr in New Jersey, in mid summer! The process to understand another culture can be very frustrated, but also very inspirating. In a large mixing bowl, combine the flour, cardamom, salt and cream of tartar. In another mixing bowl, beat the butter and sugar until very pale and fluffy, add egg, one at a time. Combine the flour mixture and the butter mixture. Press the dough like a disk, wrap, chill in the fridge for half day. Take a small portion of dough (about 2 tablespoons), shape into a 5-inch long strand and make it into circle. Use a scissor or knife to cut the outside edge. Pre-heat 2-inch deep oil, fry the cookies over medium/ medium-high heat, adjust the heat from time to time. Springle powder sugar over the cookies to serve. Gattina you rock- I truly bow down to you. This is the kind of thing that I would drool over but not have enough courage to make...esp bec it is fried. V true insight about understanding other cultures. Gorgeous in every way. Aroma, flavor and eye candy all in one. Thanks for the entry to WHB. very nice recipe...and they look superb.Just excellent.Thanks for sharing gattina. Wow, those look great. 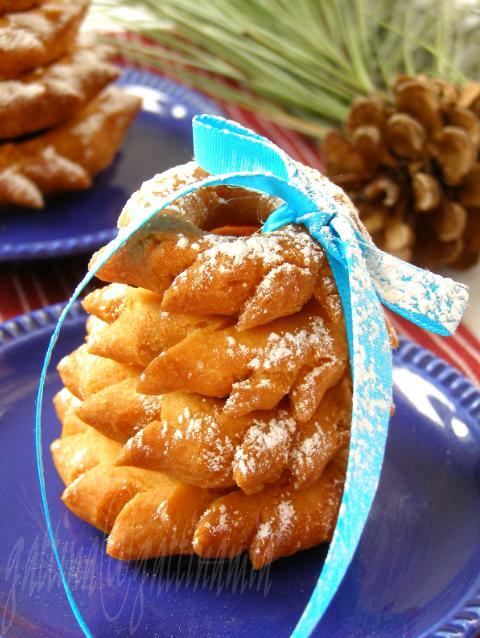 Fried cookies, very interesting. 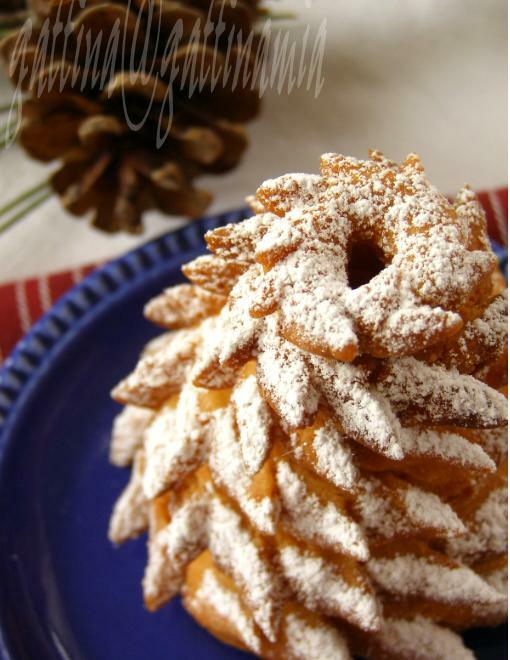 gattina, what a wonderful seasonal recipe.nice pic. They do look very yummy. I like it also that WHB helps us learn so much about other places and cultures. I am coming back again and again to look at these photos. Looks like a sculpture, you are just fabulous Gattina. Gattina, these cookies look so lovely! You gave me a good idea for Christmas - just have to pray for the weather to help (I live in Brazil). The thing you said about understanding another culture is very nice and true. I had classes in the university about USA and UK, since I studied English. The professor used to tell us the it would be a lot easier to learn the language if we knew at least a bit about the countries, the people, etc. that is really nice... so artistic and it looks very good! lovely recipe Gattina. will give it a try. meeta, thanks! I'll "see" you again at the recap. Sher, you always make me smile :) Maynot ideal for gift though as the fried food best to consume in the same day. Shaheen, thanks a lot to your compliment! Archana, I'm really flattered, esp you're an excellent cake maker, what you said really means a lot to me. Thank you so much my friend! Patricia, thank you for your comment! Your professioner is really right! I'd learnt English in school (in a non-English speaking country) close to 20 years, but realized that I actually couldn't speak this language after I moved to Singapore (English speaking country). 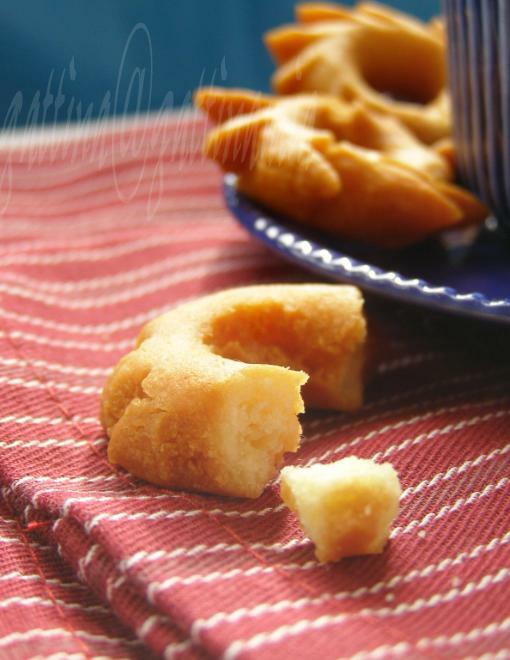 Confessiom: I've never eaten cardamon, but if you can make this cookies I'll try immediately! Once again, another beautiful presentation! OMG!! Those cookies look awesome!! wow, gattina, those are truly stunning! you have such a gift for putting a dish together! Hi Darling! my birthday will be on 24th of november!!!! Really your mother in law is from Penne? I know this village very well! We go there in august for a fantastic Summer feast and....there are so many things to eat! These look simply out of this world Gattina. I have to try this. Deep fried and use of cardamom ... hmm .. I can already imagine the taste. Look at this pile of sweet treats! God Lord. Gorgeous once more, Gattina! Gattina, you're incredible! You have wonderful recipes and they come with great presentation. I wish I had the same patience for baking. how pretty is that! 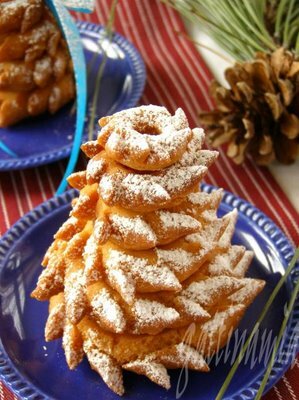 A Cardamom cookie that is fried, this recipe has delicious written all over it, it looks amazing too, like a christmas tree, would make a perfect little treat for X'mas ! This truly looks and sounds wonderful! I love the name fried cardamom cookies. I can already imagine how it tastes. Oh my! These look AMAZING and I bet they taste even better. And you are one inspiring food blogger! I have recently discovered your blog and I am in love...beautiful writting, recipes and pictures. This recipe is brilliant. I love cardamom, and anything fried rocks! Saffron, maybe you can tell me more... I don't often see cardamom in Italian cooking. Joey, thanks for visiting my blog :D I'll go and look if there's any pulla in that book (it's not in my house now). I'll tell you in your blog later. Brilynn sweetheart, thanks for your sweet comment! Lis my dear, yea, they're delish! Anita, I'm really very flattered :D You're another great baker I admire! Krithika, thank you my friend! This lady she makes great recipes, or just because I like deep-fried/ rich food. Ari, oh you're very sweet! Thanks for your encouragement! Hi yummie dummies, it's lovely to have your visit! Helene *high five* A lot of people have misconception fried-food fatty. But for me the key is moderation. And I'm really happy to have your visit too! Banu, thanks for letting me know the result! I went back to double-check my ingrident list and discovered a typo. Instead of 4 cups I typed 2 cups by mistakes. I have revised the whole list. I apologize.